Creation of a Java Map from two Arrays. Fries, Christian P.: Comments on Handling Objects in Spreadsheets, http://www.christian-fries.de/objectinspreadsheets. The following is a short overview over the spreadsheet functions provided by Obba. obAddAllJars, obAddClasses, obAddJar: loading of Java libraries/classes. obMake: create a primitive value or an object using its constructor. obCall: invoke a method on an object. obGet: convert an object value to a spreadsheet type. obRelease: release an object from the object handler. obReleaseDeferred: release an object from the object handler after its next use. obRun: asynchronously invoke a method on an object. obSync: synchronize the result of an asynchronously invoked method or provide block synchronization. obCast: change the type of an object (rarely needed). Java libraries may be loaded as jar or class files. 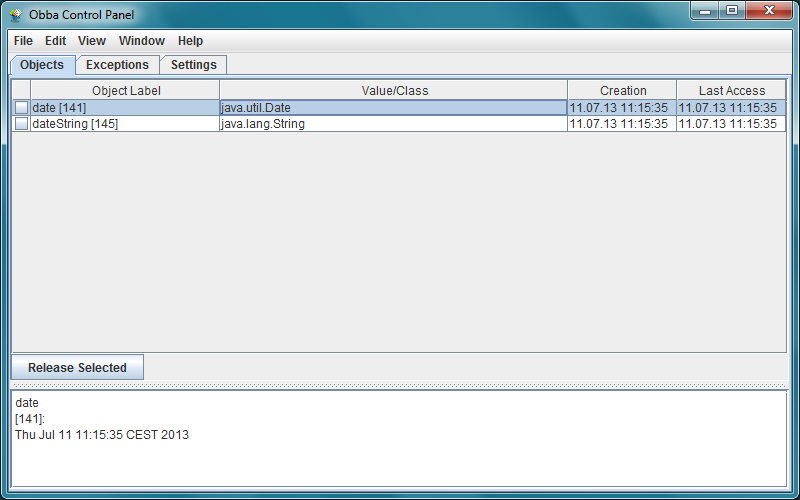 Obba provides spreadsheet functions to add jar files or class folders to the class loader of your Java virtual machine. The jar files can be added at runtime, at any point during your spreadsheet calculation. It is not necessary to have the jar files in your classpath. Note on class loading: Classes made known to the Java virtual machine via the class path of the Obba Server are known to the classes added via one of the functions obAddAllJars, obAddJar, obAddAllJars. Classes added though one of the functions all share the same class loader, i.e., they do know each other. However, classes added through these functions are not known to the classes added via the class path of the Obba Server (in most situations this is not an issue). Add jar file(s) in a given folder to the class loader. The path to the folder containing the jar file(s). Optional parameter. If true, the path is relative and the current worksheet path added. If missing, isPathRelative is assumed to be false. Add class folder to the class loader. The path to the folder containing the class file(s). The path has to be a classpath (in the Java sense) not just any path to .class files, i.e., the directory layout has to correspond to the Java packages. Add a jar file to the class loader. The path to the jar file. The object labels are assigned by the user upon creation of the object or primitive value. They specify the object's storage place. The object handle is generated by the object handler upon storage of an object. Object handles must be used to access an object. The generated object handle consist of the object label plus a # character and a unique integer number (do not rely on this). If you create an object under an object label that is already associated to another object, then the other object is released from the object handler and the new object is assigned the object label. A new object handle will be returned and the old object handle is no longer valid. The released object will be marked for deletion if no other object holds a reference to it. Objects are created through the spreadsheet function obMake. Create an object calling a constructor of the given class using the given arguments and storing it under a given object label. The label under which the object should be stored in the object handler. If objectLabel is an empty string, a transient object label is generated and returned. Optional. Additional parameters. See section entitled "Parameters". The object handle by which the object must be referenced when used as an argument: see section entitled "Object Labels and Object Handles"..
int: If the className is "int", obMake expects a single integer parameter and stores it as a Java int. double: If the className is "double", obMake expects a single double parameter and stores it as a Java double. boolean: If the className is "boolean", obMake expects a single boolean parameter and stores it as a Java boolean. String: If the className is "String", obMake expects a single String parameter and stores it as a Java String. byte: If the className is "byte", obMake expects a single integer parameter and stores it as a Java byte. short: If the className is "short", obMake expects a single integer parameter and stores it as a Java short. long: If the className is "long", obMake expects a single integer parameter and stores it as a Java long. float: If the className is "float", obMake expects a single double parameter and stores it as a Java float. char: If the className is "char", obMake expects a single character parameter and stores it as a Java char. Integer: If the className is "Integer", obMake expects a single integer parameter and stores it as a Java java.lang.Integer. Double: If the className is "Double", obMake expects a single double parameter and stores it as a Java java.lang.Double. Float: If the className is "Float", obMake expects a single double parameter and stores it as a Java java.lang.Float. Date: If the className is "Date", obMake expects a single double parameter representing an Excel / OpenOffice date and stores it as a Java java.lang.Date. int: If the className is "int", obMake expects a range of integers. The range will be transformed to an one-dimensional array using row major. Likewise, the classNames "byte", "short", "long", and "Integer" will create a Java byte array, short array, long array, java.lang.Integer array, respectively. double: If the className is "double", obMake expects a range of doubles. The range will be transformed to an one-dimensional array using row major. Likewise, the className "float" will create a Java float array. boolean: If the className is "boolean", obMake expects a range of booleans. The range will be transformed to an one-dimensional array using row major. char: If the className is "char", obMake expects a range of characters. The range will be transformed to an one-dimensional array using row major. String: If the className is "String", obMake expects a range of Strings. The range will be transformed to an one-dimensional array using row major. int: If the className is "int", obMake expects a range of integers. The range will be transformed to the corresponding two-dimensional array. Likewise, the className "byte", "short", "long" will create a Java byte array, short array, long array, respectively. double: If the className is "double", obMake expects a range of doubles. The range will be transformed to the corresponding two-dimensional array. Likewise, className "float" will create a Java float array. boolean: If the className is "boolean", obMake expects a range of booleans. The range will be transformed to the corresponding two-dimensional array. char: If the className is "char", obMake expects a range of characters. The range will be transformed to the corresponding two-dimensional array. String: If the className is "String", obMake expects a range of Strings. The range will be transformed to the corresponding two-dimensional array. If the parameter className specifies a Java class name (fully quallyfied including it's package name), an object of this class is constructed using the class's constructor having the signature specified by parameters. If the parameters are omitted, the default constructor (no arguments) is called. If not, the parameters are interpreted as described in the Section "Parameters" below and define the signature of the constructor. Advanced feature: If className refers to an object handle of an object of type java.lang.Class, an object of this class is constructed using the class's constructor (as above). where the cell A1 contains an spreadsheet date. This "shorthand" is provided for convenience. Methods are invoked through the spreadsheet function obCall (via a special method name you may also access public fields). Call a method on a given object using the given arguments and storing its result under the given resultLabel. If resultLabel is an empty string, the result will be stored under a generated transient object label. The label to be assigned to the method's result. If objectLabel is an empty string, a transient object label is generated and returned. The label of the object. Optional. Parameters. See section entitled "Parameters". The object handle by which the result object must be referenced when used as an argument: see section entitled "Object Labels and Object Handles". If the method is of void return type, the method is treated as if it would return a self-reference: the resultLabel is ignored and the object associated with objectLabel gets a new object handle. The new object handle is returned. If the method is a static void, a new Boolean(true) object is stored under the resultLabel. If parameters is omitted, then the method is called without parameters. Otherwise, parameters is interpreted as described in the section "Parameters" below and defines the signature of the method. The type of the return value is inferred from the method. To invoke a class method (static method) objectLabel must refer to the class name (assuming that the object handler does not have an object under this label). Methods may be invoked asynchronously using obRun, see below. To access (get) a public field, use "." + fieldname as the methodName. Then cell A1 contains the object handle that must be used as an argument to obCall when ivoking methods on this object. The following worksheet function calls the method toString, having no arguments, on the object referenced by the object handle in cell A1 and stores the result of the method under the object label dateString. The functions obMake and obCall have an optional set of parameters parameters1, parameters2, parameters3 ..., where each parameter is a string or an array of strings. From these parameters a single vector of strings is build (buy appending the elements, row major). Each string is then interpreted as an object handle defining one parameter of the constructor or method. The advantage of this approach is that parameters may be represented by large arrays of object handles and thus there is no limit to the number of parameters. On the other hand, it is possible to split the arrays, which allows a flexible spreadsheet setup. If the parameters are (B5:B8), the method is called with (B5,B6,B7,B8). If the parameters are (B5:B6,D9,B8), the method is called with (B5,B6,D9,B8). If the parameters are (B5:B7,"dateObject"), the method is called with (B5,B6,B7,"dateObject"). If the parameters are (B5:C6,A4,D6:D8), the method is called with (B5,C5,B6,C6,A4,D6,D7,D8). Each cell referenced above must contain a valid object handle. The signature of the constructor of the method is constructed from the type of the object represented by the object handle. It is not possible to pass a literal in the parameter set. For example, the parameter set (B5, 0.5, B7:B8) is not admissible: you would need to use (B5, obMake("","double",0.5) , B7:B8). This is necessary so as to associate the literal value (here, 0.5) with its type (here, double). See also the section on compound function calls below. (Note: the example here uses a transient object handle). When you invoke a method with a given parameter list, the object handler searches for a matching method. If there is no exact match it will calculate a score and choose a method for which this score is the smallest. Currently, the score is the sum distance of the inheritance levels between the argument classes and the method signature. If there are more than one method with the smallest score, one of them is arbitrarily selected. To ensure that a method with a specific signature is chosen, objects can be cast to a different type using the obCast function. Note: In general it is rarely necessary to use obCast. Changes the type/class of an object in the object handler and returns a new object handle to the casted object. The object handle of the original object is invalidated. The object handle of the object to be casted. Java class name by which the object should be casted. A new object handle for the casted object. Return the value of an object as a spreadsheet type. double, float, java.lang.Double, java.lang.Float: Converted to a Double value. int, byte, short, long, java.lang.Integer: Converted to an Integer value. boolean, java.lang.Boolean: Converted to a Boolean value. java.lang.String: Converted to a String value. One-dimensional arrays of the above types are converted to a row vector of values (use the spreadsheet function TRANSPOSE to get a column vector). Two-dimensional arrays of the above types are converted to a two-dimensional range of values. Note: If you convert an array (String, String, double, double, etc. ), then the spreadsheet function has to be treated as an array function (in Excel: mark the region where the result should appear, enter the formula and press CTRL-SHIFT-RETURN (or CTRL-SHIFT-RETURN), see Introducing array formulas in Excel). All other objects are converted to a String value using the objects toString method. This allows visualizing objects, e.g., collections (e.g., HashMap). An object may be released from the object handler using the obRelease function. Release an object from the object handler. obMake and obCall return the object handle of the newly created object or the result of a method call. Thus it is possible to pack execution chains into a single function call. This is useful if you want to display the result of a call (combine obCall and obGet) or directly use a created object as a parameter (combine obMake and obCall). An object must be referenced by its object handle; using the object label is not sufficient. Thus, if the object is referenced as an argument of some worksheet function (e.g., calling a method), then the object handle must be used. Since object handles are generated, it has to be passed by referencing the corresponding cell, rather than using a literal. Object handles for the same object label (even for the same object) may change to show that the object may have been altered. Building the correct spreadsheet cell dependencies is important. For example, a cell dependency enforces the spread sheet application to first call the function that creates the object, then calling the function that calls a method on the newly created object. To some extend, Obba checks for the cell dependency by generating and returning a new object handle every time the object is the result of an Obba function call. The consistency check can be disabled in the control panel. Alternatively, there is a worksheet function, obGetHandle, that can be employed to obtain an object handle for a given object label. Get the object handle for a given object label. Note: compromises the cell dependency and thus its use should be avoided. It is chiefly useful if you have a spreadsheet that should work on an object created by some other sheet (e.g., restored from a file) but do not know the exact object handle. The user specifies the the object label "myObject" to be assigned to a newly created object. The object handler returns, e.g., "myObject #3". If the object is to be used as an argument to some function, "myObject #3" must be used as the object handle. A call to obGetHandle("myObject") will return "myObject #3" - the current object handle. Objects have to be manually released from the object handler using the obRelease function. Thus, in the example above, the objects with the labels "dateString" and "dateObject" will be maintained until obRelease is called explicitly. However, for compounding function calls it may occur that a newly assigned object handle is used only as an argument and never used again. In the above example this situation could apply to "dateString" and/or "dateObject", given that the two labels are not used anywhere else. In this case, a transient object label may be used. The object handler will generate a unique object label. The object will be stored under this label and a corresponding object handle will be returned by the function obMake or obCall. The object will be released automatically, the first time (!) this generated object handle is used as a parameter in any of the functions obMake or obCall or obGet. If an object has been created under some object label elsewhere, but should be released after it has been used by a function call, its object label may be converted into a transient object label using the obReleaseDeferred function. Release an object from the object handler after it is used for the first time. The transient object handle of same object. Note: Internally, a new transient object label will be crated for the object and the old object label will be immediately released. Obba allows executing methods on objects, and thus worksheet functions, asynchronously. Thus it allows building highly parallelized, massively multi-threaded worksheets. Methods are executed asynchronously using the obRun function. Asynchronously calls a method on a given object using the given arguments and stores its result under the given resultLabel. If resultLabel is an empty string, the result will be stored under a generated transient object label. The object handle by which the result object must be referenced when used as an argument: see section entitled "Object Labels and Object Handles". If the method is of void return type, then the method is treated as if it would return a self reference: the resultLabel is ignored and the object associated with objectLabel receives a new object handle. The new object handle is returned. If the method is a static void, a new Boolean(true) object is stored under the resultLabel. Obba provides a basic synchronization. The function obRun returns the object handle of the result. The first time this object is accessed, the thread generating it will be synchronized and the object will be assigned to the handle. Basic synchronization is often sufficient, but does not guarantee that there are no side effects, i.e., two concurrent threads modifying and accessing the same object. Therefore obRun must be used with caution. Use obSync to provide additional synchronization. The notes relating to obCall are applicable here. Asynchronously executed methods can be synchronized by using the obSync function. The function takes a list of object handles and synchronizes all objects associated with these labels. Wait for the calculation of the given object handles. The first argument will in the argument list. This section explains how to realize other language constructs such as arrays, inner classes and enums. There may be the need to pass a Null reference as a function argument. You may create a Null reference of a specific type with a given object handle (although null is not an object) using the obCast function where the object handle parameter corresponds to a non-existing object. given that an object "myString" does not yet exist (otherwise obCast would try to cast that object to a String). You can access an array by using obCall with the method name being "" and one integer argument denoting the index. Multi-dimensional arrays can be accessed similarly, i.e., an element of a two dimensional array is obtained through obCall with method name being "" and two integer arguments, a three-dimensional array is obtained through obCall with method name being "" and three integer arguments, and so forth. You can create an array of objects by using obMake with the class name ending in "", preceded by the class name of the component type. The array is initialized by the object given by the arguments of obMake. A multi-dimensional array can be created by repeating the above, that is, by creating arrays of arrays. Field may be accessed via obCall using a special method name which consists of the name of the field and a "." (dot) as a prefix. (note the "." in the method name). In Java, an inner class is a class with a certain naming convention (namely, OuterClass$InnerClass). If the inner class is non-static, i.e. has an object of the outer class as scope, then the constructor of the inner class is implicitly expanded to a constructor taking a reference to an object of the outer class as an additional first argument. Hence you can construct an inner class using the OuterClass$InnerClass notation and add the object handle of the scope object as a first argument. If the inner class is a public static class, then you may call its constructor(s) via OuterClass$InnerClass passing all arguments as specified by the specific constructor. In Java an enum is a class. Hence you can create an enum using obMake with a constructor or obCall with some factory. An enum may be created through the static method valueOf providing the enum value as a String. If the enum is part of a class it is treated as an inner class. If an enum is stored under some object handle, calling obGet on that handle will convert the enum to a Spreadsheet string (the Java toString-method will be called on the enum). would return the enums value as a string, i.e. ONE. Obba comes with some utility Java classes which are directly accessible from the spreadsheet (using obMake, obCall) and provide convenient methods for creating some frequently used objects. Obba allows to create an array directly from a spreadsheet column. The class info.obba.javatools.Collections provides the static method public static <K,V> Map<K,V> fillMap(Map<K,V> map, K keys, V values) which may be used to conveniently create a corresponding map. The following spreadsheet function will create a HashMap with keys (String) from column A1:A5 and values (Double) from column B1:B5. If Obba Server runs within a JDK, the javatools compiler may be used to dynamically create objects from source code passed as a string argument. The class info.obba.javatools.Compiler provides the method public java.lang.Class<?> sourceToClass(String className, String source) which compiles a Java source code of a class to a java.lang.Class object. You can then use obMake to instantiate an object of that class by referencing the object returned by sourceToClass as the second argument of obMake. In this example we call the default constructor of mypackage.MyClass. Of course, adding the appropriate arguments to the outer obMake function will result in a call to the corresponding constructor. Input values or other data being input to the objects and methods. Object handles returned by calls to the object handler. Return values obtained by a call to obGet. While the value of the first cell type is volatile in that it can possibly be changed by the spreadsheet user, the other elements are usually static, especially if the spreadsheet has gone past the development stage. To avoid having a formula overwritten by user input and thus breaking a spreadsheet dependency tree, the different cell types above should be made distinguishable, e.g., by a scheme for background colors or fonts. Use a descriptive name as an object label. Enable "Word wrap" for the cell. This will move the unique object handle number to a new line. Set the cell height to one line, this will hide the additional text such that only the object label is visible. The Obba control panel showing for each object its label, type, creation time and last access time. The function obControlPanelSetVisible switches the Obba control panel on or off. Switch the Obba Control Panel on or off. If true, the Obba Control Panel will be made visible; else invisible. The Obba Control Panel allows viewing all objects in the object handler and permits releasing selected objects from the object handler. Note: Releasing non-transient object handles via the Obba Control Panel is not recommended if these objects are still referenced in the spreadsheet. The Obba object dependency graph. From the window menu of the Obba Control Panel you can bring up the Object Dependency Graph. The object dependency graph shows each object as a vertex (a box) and shows, using arrows, which objects where used to instantiate that object. Objects that implement the java.io.Serializable interface can be serialized and de-serialized, i.e., saved to a file and restored from a file. This can be accomplished via the Obba Control Panel or through the worksheet functions obSave and obLoad. Save Serializable objects to a file. If a list of object handles is given, then only those objects are saved to the file. If no list of object handles is given, then all objects are saved to the file. The file name under which the object should be saved to. The labels of the objects saved. Load Serializable objects from a file. If a list of object handles is given, only those objects are loaded from the file. If no list of object handles is given, all objects are loaded from the file. Objects currently in the object handler are either left intact or replaced.